Educational Qualification :- Candidates must have passed 8th Standard. 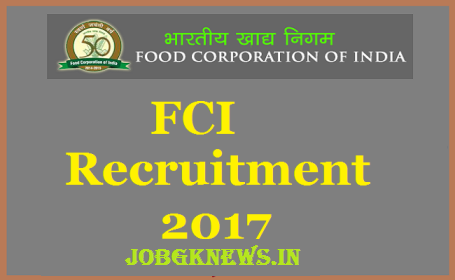 FCI Selection Process :- Selection will be made on Written Exam & Physical Endurance Test. Application Fee :- Candidates have to pay Rs.300/- through SBI Internet Banking, other major bank’s Internet Banking, Debit/Credit Cards or e-challan at branches of SBI. How to Apply FCI Vacancy :- Interested candidates may apply Online through FCI website www.fciwbjobs.com from 18.09.2017 to 18.10.2017.